Standing quietly on the river trail, I watched the beaver swim and drift downstream with the current and gave a silent prayer, for the thousand's time, to this friend of the steelheader. How many times, I asked myself, during many winter steelheading seasons, had I watched their engineering progress on a streambank fallen alder or evergreen that had effectively blocked a pool or shallow riffle. They had gnawed until all branches were stripped or cut off thereby releasing the trunk to drift downstream but, up against the riverbank, and clearing it from a steelhead holt. How many times I thought, as he disappeared downstream, had they chewed that solid third leg which I had picked up on the riverbank. That natural staff which had propelled me safely across uncountable rain swollen rapids? Yes, the beaver is more than just a friend of the steelheader, he could easily be called their totem. He ensures clear fishable streams, headwater nurseries, and, supplies a solid light wading staff unmatched by any manufacturer or advertised in any catalogue. Many years ago I purchased one of those lightweight telescopic aluminium wading staffs only to find when it was put to a severe test, that one of the extensions would slip throwing me off balance. Once, I remember only too well, I fell head first into cold February waters when an extension tube suddenly gave way leaving me soaked many river bends from my truck. This reminder of our technical world still hangs on a peg at home but, now, it is almost hidden by the collection of beaver chewed lightweight wooden staffs that I have since collected along numerous riverbanks. 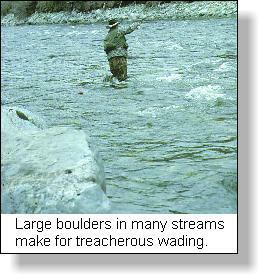 River wading is one of the most important skills stream anglers need to master if they are to be consistently successful and enjoy a day's fishing. It is a skill which is mastered only after many years of experience but, there are some tips which can hasten this mastery. While the majority of coastal streams can be crossed there are a few, even though they appear small, should never be waded because of treacherous large boulders which are impossible to negotiate safely. On the other hand, the majority of coastal streams have culminations of sand and small gravel that allow for easy crossing. You must be the judge of your experience and the underwater debris that you face. 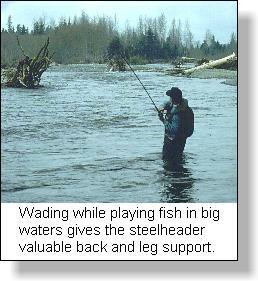 Wading has greatly increased my steelheading success over the years and has allowed me to beach many wild run-out steelhead that have gone downstream when they have been hooked. I am an aggressive wader because I can swim and I wear floater safety coats while on the river. But, decades of wading, while giving me greater opportunities to hunt for steelhead, have also taught me to always test the water current before I commit myself to cross. When you wish to cross a stream choose your crossing carefully! The easiest water is usually at the tailout of a stream pool, that slow shallowing water just prior to downstream rapids. Here the main force of the current is slowed and the water depth is only hip deep or slightly higher. Drift with the current as you cross. Forcing yourself upstream will often undermine the sand and gravel underfoot resulting in treacherous unstable footing. I like to 'cork' as I cross a stream, bending first into a crouched kneebend position and then I flow with the current to bob diagonally down and across the stream. Always 'crab-walk' when you wade! Keep your knees bent and crouch forward to give yourself complete balance as you move across the stream. I have found that high hip or waist deep water allows a buoyancy which gives much greater control and balance. Often when I am crossing a new section of river I will wade into the stream until I am in waist deep water. Then, following the contour of the pool, I will walk-bob-cork downstream along the near side of the stream until I have found the hip deep contour at the tailout of the pool. Here is where I will then wade across to the far streambank. 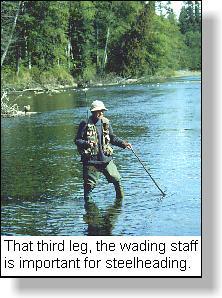 Point your foot upstream when you are wading. This gives a much smaller surface for the water to bypass and, at the same time, it gives you a control over where each step can be placed. Do not turn your back on the current! This is the position of least control! Once you have done this you will find yourself stumbling constantly eventually to fall in the water. Beware of river flotsam! Small twigs, bark and branches are a certain sign that the water level is rising. When you see these in the river plan your crossings carefully so that on your return you are still able to wade back across the river. The most dangerous water to cross is that which is ankle or calf deep rushing over slippery cobble stones. The danger comes from the injury you might receive when you stumble and fall on these stones. If you have a partner, cross with one hand tightly gripped on the shoulder of each other's coats! Holding onto shoulders gives both of you the freedom of an arm's length to step over boulders or other hidden underwater snags. 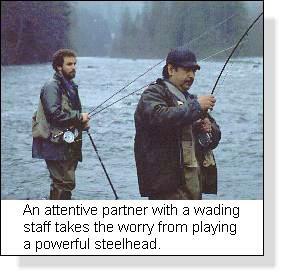 When crossing with a partner, the upstream angler should use a wading staff with his free hand while the downstream angler carries the rods in his free hand. If you are crossing a particularly fast and forceful current, one angler should brace himself before the other moves forward; then, the other angler moves forward and braces himself; and so forth, until you have negotiated the treacherous section. Finally, when with a partner, don't release your hold until you are both on dry ground! It is amazing how often, in the last few feet before the bank or beach, that you will stumble, fall, and injure yourself on rocks. Your partner's balance is most critical during these final few meters!